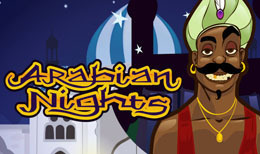 Is it just us, or is there something quite appealing about an Arabian-themed slot game? Maybe it’s the idea of being miles away in a warm Middle Eastern climate, or perhaps it’s something about the treasures that lie there. Whatever it is, the game’s exotic lands seem to increase the level of excitement players feel when they are playing. Typically, we associate this kind of slots with famous characters such as Aladdin and Sinbad, and once you start playing you can see how their stories fit in. With a night-time setting featuring a mosque illuminated by the moon, this game has a sense of enigma surrounding it, making it all the more intriguing. The audios are also another contributing factor, sounding out what can only be described as a chant. During the gameplay, each symbol has a different value, and those with the lowest worth are cards with a mosaic look. Symbols with a higher worth all have something to do with the theme from a camel, pointy shoes and a fez. With more and more games being added to their collection, NetEnt are always looking to improve their game-play. In doing so, they also recognise the need to make their slots available across a range of channels from mobile to retail and desktop of course. Some of their games of become extremely popular, in particular for their characters. The Invisible Man, Gonzo’s Quest and Starburst have all proved a hit over the years. Whether players appreciate these games for their animations or special features, it doesn’t matter because they have an all-round appeal. They create slots for every ability too, so every gamer is able to enjoy them, even those who class themselves as beginners. This 10 payline progressive slot game by NetEnt is quite the game-play. As always you need to pay attention when it comes to two symbols – the price (WILD) and Aladdin’s lamp (SCATTER). You will start your desert journey by adjusting your stake. The Free Spins are easy to come by in this game, all you have to do is land 3 SCATTER symbols across any of the reels and you’ll receive 15 further spins. As the game progresses, you can secure even more Free Spins, so don’t give up on those SCATTERS. If you want to win big, this is where the progressive jackpot comes in. This is possible when you land five or more Wilds on any given pay line. Nevertheless, if you want to win a big pay out, you must be willing to set your coin wager to the highest value. If you take into account the game’s release date, it is pretty impressive for its time. Yes, the graphics aren’t flawless, but the game still has all the elements of an entertaining casino game – some might say it was ahead of its time. The plentiful prizes and progressive jackpot are bound to keep players satisfied well into the night.